In original printed card covers. Hélène Heinsdorf's pictorial ex libris inside. (Could be the Polish journalist Helene Heinsdorf-Lewinson? See Sonderfahndungsliste G.B.). In very good condition. Paper yellowing a little. 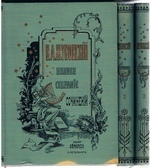 ; The present volume was published in 1923 by Zlatolyra in Sofia but actually printed in Berlin. By this time the author was living in Prague. 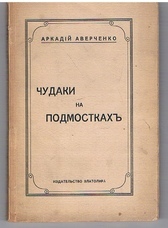 Born in Sevastopol in 1881, the satirist Averchenko moved to Petersburg in 1908 where he became editor of the magazine Dragonfly, later Satyrikon and New Satyrikon. 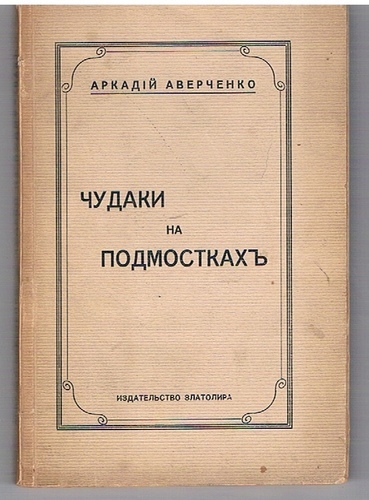 Frequent contributors were humourist Teffi (Nadezhda Lokhvitskaya), graphic artist Re-Mi (Nikolai Remizov) and the poet Sasha Chorny (Alexander Glikberg). After the October Revolution, the journal was declared anti-Soviet and Averchenko moved back home but then left hurriedly for Constantinople. He eventually settled in Prague. As well as the Ottoman capital, he also stayed briefly in Paris, Sofia and Belgrade, publishing in most of these cities. His oeuvre comprises some 20 books and numerous articles and collections. All his books are now scarce. Oblomov. Translated and with an Introduction by David Magarshack.